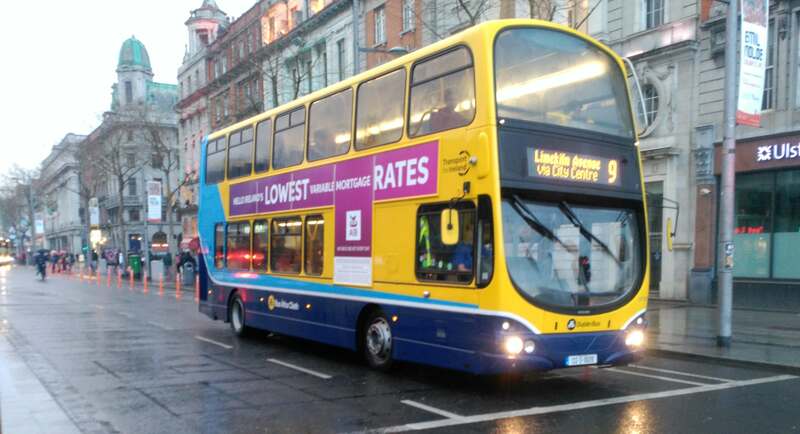 Above: Dublin Bus only accepts exact fares on all of its buses. Photo credit: Jackie Costa Ribeiro. Dublin Bus is a public transport service that is under contract from the National Transport Authority (NTA) to provide a bus service for Dublin. It operates a policy of exact fares only on its buses, so when a passenger overpays in coins, no change is returned. Instead, a paper receipt is given, which forces the customer to collect their change only at Dublin Bus head office, 53 Upper O’Connell Street. Around 83% of refunds in 2016 on Dublin Bus were left unclaimed, which represents over €800,00. In most other cities in Ireland and in most other countries in the world, change is provided on public transport. The coin fares on Dublin Bus are not always even, for example €2.85, which means that it is often difficult for customers to have the exact fare in coins. Also, sometimes Dublin Bus drivers do not even give customers a refund receipt when a refund is due. In addition, the ink on refund receipts begins to fade away after a number of months, even if the receipt is kept safely, making it more difficult for refunds to be accepted, as the attached receipts prove. Dublin Bus state that the unclaimed refund money is held in a fund in order to be available for reclaim by passengers at any time, and that it has no expiry date. A sample of some of the amounts that go unclaimed each year are shown below. Some of this lucrative unclaimed refund money is spent on charity through Dublin Bus’s Community Spirit awards, which provide voluntary groups throughout Dublin with financial support. 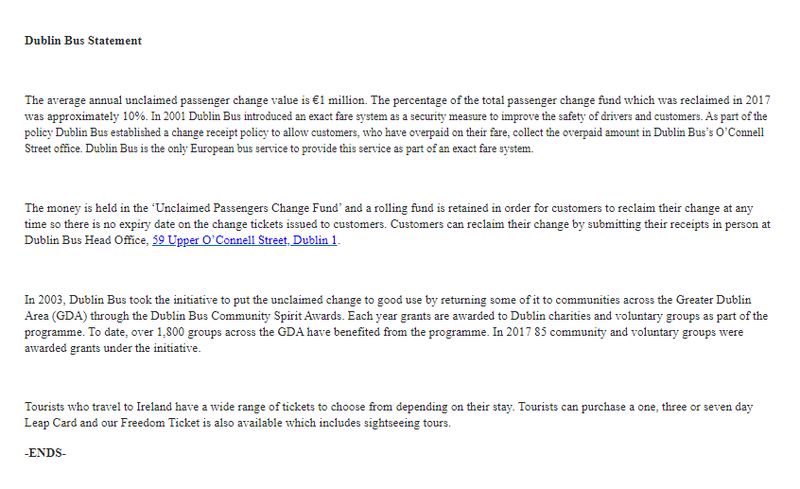 However, Dublin Bus does not publish the exact percentage of unclaimed refunds that charities receive. Nevertheless, this reporter spoke to a number of representatives of Dublin Bus drivers who claim that Dublin Bus is in fact not interested in this lucrative refund system and its long-term aim is actually to remove entirely the ability to pay in coins on its buses, in exchange for pre-paid Leap cards. “I have no idea where the money goes, the company never talks about this”, states one bus driver. This reporter is waiting for a comment on this issue from a spokesperson and Customer Service representative at Dublin Bus, as well as a National Bus and Rail Union representative. However, three Dublin Bus drivers shared their views. All three preferred not to be named, and only one agreed to have their interview recorded. One of the drivers, who has been a Dublin Bus driver for 3 years stated that unclaimed refunds are matched by those who evade paying fares. “I have no idea where the (unclaimed refund) money goes, the company never talks about this … There is plenty of unclaimed money but there are also people (who) don’t pay enough money and I let them go. Don’t say this to my bosses”, he said. He explained that the Leap card will likely replace coins in the near future on Dublin Buses, in a similar way to the pre-paid Oyster card in London. “It would be faster for me if there were no coins at all. In a few years, it will happen. In London you don’t even have to talk to the driver”, he declared. 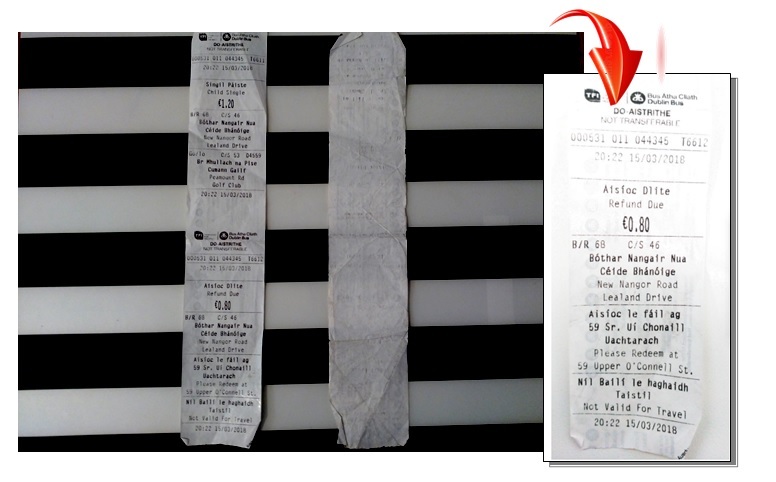 Above: An example Dublin Bus refund ticket, after a number of months, the ink on receipts fades away. Photo credit and design: Jackie Costa Ribeiro. The other drivers that this reporter spoke to about Dublin Bus’s refund system explained that the main reason why exact fares were introduced at Dublin Bus was to avoid the possibility of robberies. “It was better with bus conductors, as it left drivers to just drive”, one driver also said, referring to the fact that up until the 1990s at Dublin Bus there were bus conductors on all buses, who provided change to passengers. Above: Dublin Bus and society in 2018 at O’Connell Bridge. Photo credit: Jackie Costa Ribeiro. Dublin Bus is hoping that prepaid Leap cards will lead it into the future and resolve current problems for passengers and drivers. This reporter sent the following questions to Dublin Bus and, after this investigative piece was written, a spokesperson replied. Please see questions and Dublin Bus’s statement below. (1) Is Dublin Bus happy with their current refund system? If not, please state to this reporter. (2) What happens Dublin Bus’s unclaimed refunds? (3) What percentage of that money goes to charity? Full? If not, please state to this reporter where the money goes to? (4) Why is no change given? (5) Is the main reason to force customers to have exact change due to safety? Will Dublin Bus be forcing passengers to only use Leap cards in future? (6) Does Dublin bus think that it is unfair that passengers have to go to the head office to reclaim their own money? (8) Do some passengers blame bus drivers about not getting cash refunds on buses? What do Dublin Bus do, to help them to deal with this situation? (9) About tourists coming to visit Ireland, who are not able to reclaim their money due to a short length of their visit. What is your position on this fact? (10) Safety should be provide by the government. Should Dublin Bus improve that system to give back the money to the passengers? If not, please state. (11) If there is any question that I haven’t asked and you as the department would like to include please, feel comfortable. The average annual unclaimed passenger change value is €1 million. The percentage of the total passenger change fund which was reclaimed in 2017 was approximately 10%. In 2001 Dublin Bus introduced an exact fare system as a security measure to improve the safety of drivers and customers. 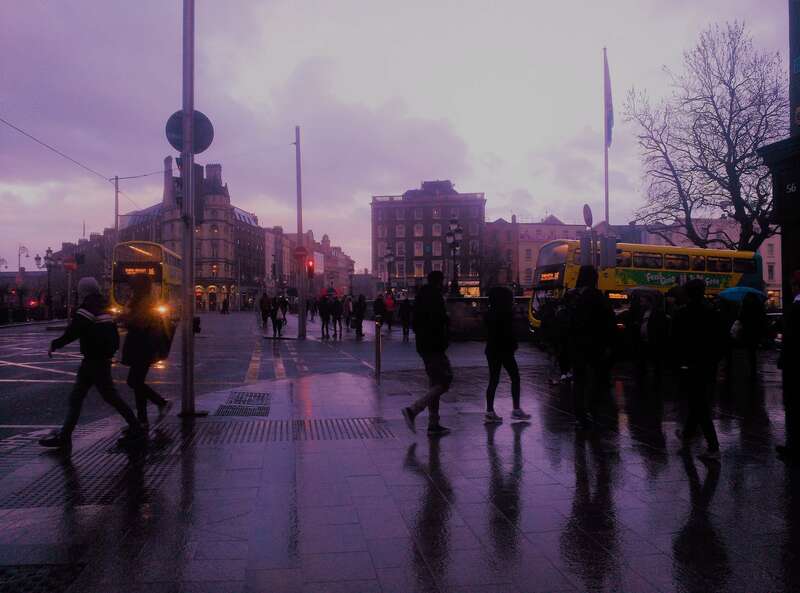 As part of the policy Dublin Bus established a change receipt policy to allow customers, who have overpaid on their fare, collect the overpaid amount in Dublin Bus’s O’Connell Street office. Dublin Bus is the only European bus service to provide this service as part of an exact fare system. The money is held in the ‘Unclaimed Passengers Change Fund’ and a rolling fund is retained in order for customers to reclaim their change at any time so there is no expiry date on the change tickets issued to customers. Customers can reclaim their change by submitting their receipts in person at Dublin Bus Head Office, 59 Upper O’Connell Street, Dublin 1. In 2003, Dublin Bus took the initiative to put the unclaimed change to good use by returning some of it to communities across the Greater Dublin Area (GDA) through the Dublin Bus Community Spirit Awards. Each year grants are awarded to Dublin charities and voluntary groups as part of the programme. To date, over 1,800 groups across the GDA have benefited from the programme. In 2017 85 community and voluntary groups were awarded grants under the initiative. Tourists who travel to Ireland have a wide range of tickets to choose from depending on their stay. Tourists can purchase a one, three or seven day Leap Card and our Freedom Ticket is also available which includes sightseeing tours.